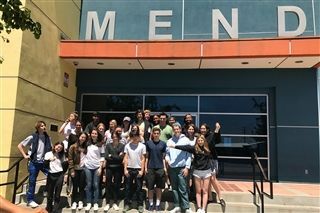 Similar to the 9th Grade Service Retreat experience in March, groups of Windward seniors (along with faculty and staff chaperones) traveled all across Southern California for a day of service on Friday, May 19. The sites of services included MEND, the Do Good Bus, and Food Forward. The Do Good Bus creates community by the shared experience of volunteering on a bus visiting various sites in Southern California. Food Forward collects produce that would have otherwise gone to waste, and connects with over 300 agencies and organizations that work to achieve food security in Southern California. 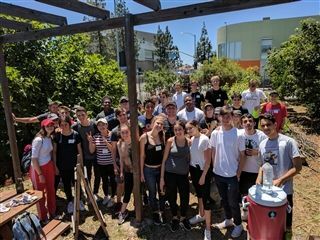 "My group traveled to The Accelerated School near USC to work with Enrich LA, a non-profit that build gardens for outdoor classrooms and to help kids learn healthy eating habits in low income schools. Everyone worked so hard in the blazing sun and we made real progress! It was truly sensational. And what a better way to end the year before heading of on our Monterey trip, and Night on the Bridge, and graduation than giving back to the LA community," said Peggy Procter. MEND stands for Meet Each Need with Dignity, and provides a variety of resources, such as job training, medical, dental, and vision care, clothing donations, and a food bank, to clients who live at or below the poverty line. "We had a lovely time at MEND. As my fellow chaperone Frances put it, it was wonderful to see our students engaged outside of their element. It helped them to see that small acts can have a big effect. The fact that our students packed boxes of food for families in need, or unpacked boxes of food donations for MEND's Food Bank, or hung up clothes to be donated seemed like small tasks until they began to do them. One of the best aspects of this role is to help get our students to see themselves as problem solvers and changemakers, and I believe strongly that many of them will confidently wear those hats as they move forward," said Service Learning Coordinator Patrick Warfield.